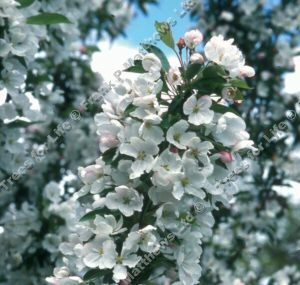 Admiration, also known as Adirondack (Malus 'Admiration') is a delightful, dwarf, upright growing, shrubby, small crab apple tree. Dense clusters of dramatic, large waxy white flowers follow dark carmine buds. Masses of persistent red-bronze fruits last into December. Ideal for restricted spaces and patio growing. Admiration is supplied at a height of between 1.0 and 2.0 metres in a 7-12 litre container for year round planting and better results than from either bare-root or rootballed stock.